Frisk Frugt (Fresh Fruit) is the working name of Danish musical living historian Anders Lauge Meldgaard whose previous record Burkina Faso idethimmelblå rum hvorsolenbor, suite (2010), was an exploration of African music and its relationship and commonality with European, or in this case specifically Danish music. 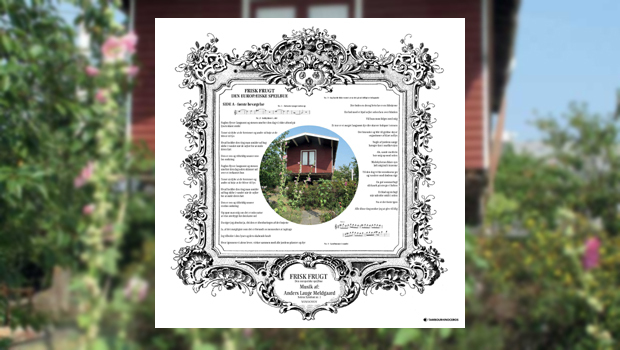 Den Europæiske Spejlbue (The European Mirror-Arch), released at the beginning of 2015, on the other hand sticks closer to home, using traditional Danish folk and folklore to craft songs within what Anders refers to as “European world music”. The sound collages that form the framework for Anders’ songs use some instruments he built himself, along with other more conventional musical tools. The end result is something of an enigma, a kind of Europeanised Sufjan Stevens in Illinois mode, drawing on a tradition of European music that shows up in bands like Sammla Mammas Manna, or Floh De Cologne for example. These bands were only ever marginally “rock” in the traditional U.S.A./U.K. sense, preferring to draw on their own heritage, and here Anders does the same, eschewing any “rock” forms almost entirely. There is an awful lot going on here, and Anders is not afraid to mix the modern with the ancient or ancient-imaginary, the heavy use of synths on Op op op op op op op og omkring being a case in point. You will find his homemade whistle-organ on Fuglens Flugt, and a midi-controlled harpsichord on Lysflimmer i vandet, and indeed everything from “electronic elements, spontaneous vocals, sound bites stolen from the internet” to “fragmentary Goethe quotes” scattered throughout this never less than interesting record. The lyrics, all in Danish, concern elemental forces at work in pre-Christian times, and there is certainly a natural and organic feel to the record that my failing to understand the language used does not diminish in the slightest. The album ends with a fantastical clockwork symphony, Omdrejningsmusik solens mekanik translating possibly as “Revolutions solar mechanics”. Using all manner of acoustic instrumentation and Anders’ arsenal of manipulative sonic devices and treated guitars, the piece builds in Reichian layers with added natural glee to become an incantation to nature, to the source of life itself. The hypnotic mantra is almost Can-like, but a million miles from the industrialised heartbeat of Krautrock, instead using the seemingly random babbling of a thousand bubbling brooks rushing through a hypereal wooded glade, the instruments played by whirling dervish wood trolls with many a skip in their step. Becoming calm, the flute leads the sated satyrs along the banks of the glistening stream and away, down the hill to evaporate into the golden mist. This is a highly captivating album that reveals more on each listen and is far more than a mere novelty, for there is great depth in these zeros and ones, and…oh…it is quite lovely.